Every Sunday and Wednesday, during the sailing season, 6-8 Captains and their crew glide out from the Kincardine Harbour and battle to win first place in the local Kincardine sailing races. Depending on the wind and weather it can be a calm sail or a challenging ride. Every boat has a different handicap or PHRF rating, so it might be possible to be first over the finish line, but not the ultimate winner of the race. Captains/Skippers are always looking for crew, so if you are interested in sailing, come down to the marina and offer your services. No experience is necessary, and a willingness to “pitch in” is always welcome. Join us on Sunday at 12:30 pm and Wednesday at 5:30 pm. Just introduce yourself and enjoy the ride! Racing began May 30th, 2018. Join us for a sail on Sunday at 12:30 pm and Wednesday at 5:30 pm. No experience necessary. Just introduce yourself and enjoy the race! 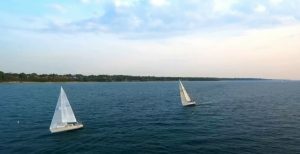 Here is a video about sailboat racing in Kincardine, provided by Lucas Garcia. This website was created by Jim Coffin, Jim Cooper and Joanne Dallman. Main page photograph by Mike Quinlan.